TRCS series drilling fluid Desander is the secondary solid control equipment in drilling fluid treatment. They can be divided into Cyclone Desander and Cyclone Desilter according to the diameter of the cyclone, mainly used for separating solid particles of47~76μm in drilling fluid. Pure polyurethane or high-chromium iron for cyclone. Clamp connection for the installation of cyclone, easy to dismantle and replace. Ball valve is installed at the inlet and outlet of cyclones, it is available to choose the cyclone number independently. Adopted international brand vibration motor, Martin or Oli motor. We can install Derrick hydrocyclones. In general, Cyclone assembly above 6 inches called Desander. 10 inches and 12inches cyclone are frequently-used. several groups of cyclone can be combined together on the basis of client’s requirements. TR® Desander is widely used for separating and sand removing in oil & gas drilling, horizontal directional drilling. 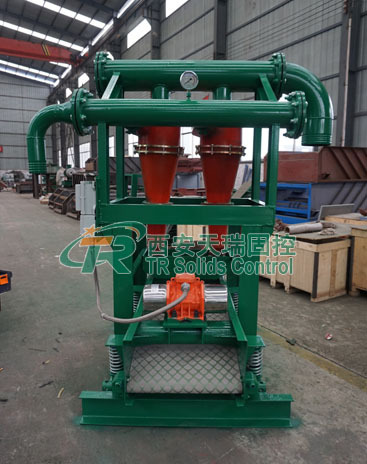 TR Solids Control provide you with good quality TR Desander, for selection of materials, advanced technique of production, fine workermanship, experienced technician,TR Solid control make the construction safe and efficient. Welcome to select TR Desander, welcome to visit our factory. We can produce customized desander as requested.